I found your product on the internet. My father is older and has recently been diagnosed with cancer. He is quite weak and having trouble getting into my automobile. I was using a regular step stool but it was small and dangerous. Every step stool I found was not practical. I found your product by entering “ senior step stool “ into search engine hoping I could find a product that was geared to someone like my dad. Maria’s father is physically weak because his cancer has zapped his strength. Finding a safe step stool for him to use would seem fairly simple but as Maria eluded it is anything but easy to find a safe sturdy step that is lightweight yet large enough for a physically challenged elder to maneuver on. Maria found the Senior Step to be the step stool that best suited her dad’s needs because of the large top surface and the sturdy design of the rest of the step. David DuPont invented the Shure-Step. 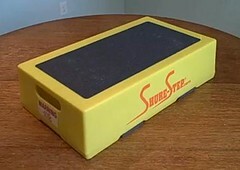 It is a stackable safety step rated at 500 pounds that has many uses; Seniors, bariatric patients, physical therapists, rehabilitation facilities, bus, train, aircraft and transportation drivers, warehouse workers, mechanics, and technicians, even children benefit from the stability and strength of the Shure-Step. Shure-Steps have a non-slip surface with height starting at 6 and 10 inches, and allows you to stack them to reach up to 16 to 22 inches high or more for a guaranteed safe reaching and stepping aid.